For example; Joe Bloggs experiences some difficulties during a Video Meeting and wonders, if perhaps, this is a common problem that can be fixed. 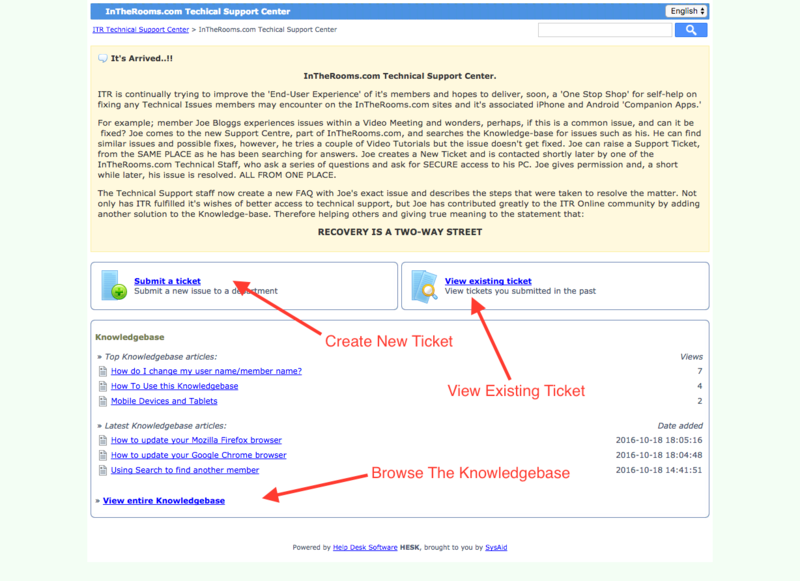 Joe comes to the new Support Center, a part of InTheRooms.com, and searches the Knowledge-base for similar issues and possible fixes. If, after viewing a couple of Video Tutorials, he still cannot solve the problem, Joe can open a Support Ticket that can be found in the SAME PLACE he has been searching for answers. Joe creates a New Ticket, describing the problem and is contacted by one of the InTheRooms.com Technical Staff, who will ask a series of questions and may ask for SECURE access to his PC. When Joe gives permission, the technician will analyze the problem and a short while later, his issue is resolved. ALL FROM ONE PLACE. If you are experiencing problems with the IntheRooms App (button logo is a blue tree on a white background), the Apps are going through an update to try and fix unknown bugs. Please bare with us and please keep trying. In the meantime, it is pointed out that https://IntheRooms.com is available using a PC or Laptop; and compatible web browser, it will always be more stable and functioning than the mobile apps, which were built as 'companions' to this main site.